Bio-based succinic acid has risen in popularity as a potential substitute for petroleum-based methods of producing numerous useful derivatives cost-effectively. In emerging and developed countries, rising shift of industry players toward green chemicals is a key underpinning in the evolution of the bio-based succinic acid market. The acid has gained currency as a platform chemical in various countries across the world. Bio-based succinic acid is also finding widespread usage as a feedstock in the production of several biodegradable products. Thus, growing shift of countries toward low-carbon economy is a notable trend boosting the market. In the near future, several exciting applications of succinic acid will emerge, notably in making polyesters polyols. This will keep the global bio-based succinic acid market lucrative. Bio-based succinic acid has replaced butane-based maleic anhydride and has been occupied crucial role in bio-refining process. The global bio-based succinic acid market is expected to clock a robust CAGR of approximately 20.0% during 2017–2026. The global market is anticipated to collect a revenue of more than US$900 Million by the end of the forecast period. Based on process type, the global bio-based succinic acid market is segmented into ammonium sulphate process, direct crystallization process, and electrodialysis process. Of these, ammonium sulphate process holds a major share, and is trailed by direct crystallization. However, the other segment is expected to rise at a higher, vis-à-vis revenue, during 2017–2026, generating higher chunks of revenue by the end of this period. On the basis of end users, the report segments the global bio-based succinic acid market into chemical industry, food, pharmaceutical, personal care, and agriculture. Of these, the chemical industry is likely to serve the major share of global demand for bio-based succinic acid as high value and commodity chemicals. This is attributed to a slew of recent applications of the chemical. Moreover, the focus toward environmentally-friendly chemicals in the sector is expected to bolster the demand. Moreover, the rapid strides being made in bio-refining process is also fueling the end-use application of bio-based succinic acid in the chemical sector. The various application segments of bio-based succinic acid are 1,4 butanediol, polybutylene succinate, plasticizers, polyester polyols, polymer and esters, and solvents and coatings. The acid is witnessing a prominent demand in producing 1,4 butanediol in recent years. The various regional markets for bio-based succinic acid are North America, Latin America, Europe, Japan, the Middle East and Africa (MEA), and APEJ. Of these, Europe held the sway by acquiring a major share in 2017. However, constantly increasing numbers of prominent players renders North America as a potentially lucrative market. The two regional markets combined are likely to contribute about two-third of the total global revenue share during the forecast period of 2017–2026. The growth in these regions is bolstered by rising numbers of commercial production facilities and expanding research and development centers of top players. The unveiling of new products has also kept these regional markets increasingly promising. Some of the prominent companies in the global bio-based succinic acid market are Koninklijke DSM N.V, Roquette Frères S.A., Myriant Corporation, Corbion N.V, BioAmber Inc., and BASF SE. Transparency Market Research (TMR) has recently published a comprehensive report, which delivers precision analysis and insightful forecasts on the global bio-based succinic acid market. The report studies the global bio-based succinic acid market in detail, enveloping key market dynamics exhaustively. 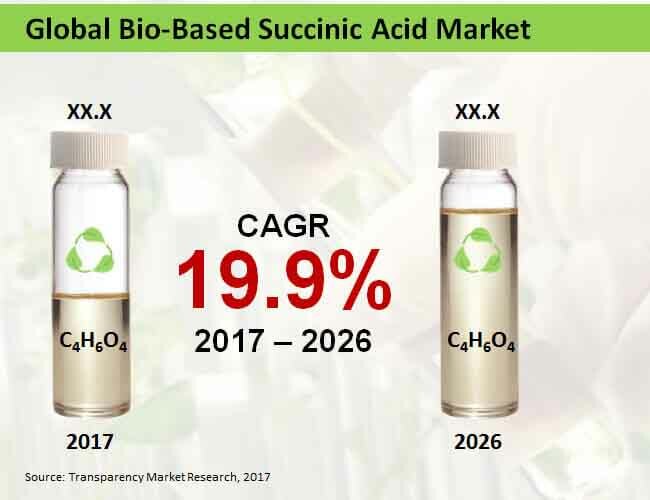 Along with providing information restraining factors, propelling factors, and trends that affect the market expansion, the report also delivers analysis on data across different parameters to reach at significant market numbers for bio-based succinic acid. The report’s first chapter provides the executive summary of global bio-based succinic acid market. A précis of bio-based succinic acid market at a global level has been delivered in the report, coupled with relevant market numbers including the historical (2012-2016) and the forecast (2017-2026) compound annual growth rate (CAGR). Based on sales expansion and revenues reaped from bio-based succinic acid sales, the report offers information about remunerative regions for growth of the bio-based succinic acid market. A chapter on the global bio-based succinic acid market’s overview follows the executive summary. This chapter incorporates a formal definition of “bio-based succinic acid”, which follows its market’s introduction. The overview of the market depicts a clear picture of the global bio-based succinic acid market’s broad scope to readers of the report. The chapters following the overview elucidate important dynamics impacting the global bio-based succinic acid market, engulfing key nodes such as the bottom line of enterprises, the fiscal stimulus, and the global economy. The report’s succeeding chapters include information associated with the market’s cost structure and pricing analysis. The report further examines the global market for bio-based succinic acid on the basis of a segmentation analysis. In this chapter, the market has been divided by the report in terms of four key segments viz. process type, end-user, application, and region. Market share comparison, along with Y-o-Y and revenue growth comparison of the market segments have been included in the report, for providing the most significant numbers corresponding to the segmentation analysis. Global bio-based succinic acid market has been categorized by the report into six key regions viz. Latin America, Japan, North America, Europe, Middle East & Africa (MEA), and Asia-Pacific excluding Japan (APEJ). The report offers a scrupulous analysis on the competitive landscape of global bio-based succinic acid market, which incorporates information about prominent industries that are performing well in the global bio-based succinic acid market. Occupancy of key players in the market has been portrayed by the report with the aid of an intensity map. This culminating chapter of the report emphasizes on profiling key market players rigorously. Insights about the market players has been offered based on the SWOT analysis, which illuminates the strengths, weaknesses, opportunities, and threats impact that specific player. Information on the key developments, product overview, key financials, and company overview of the market players are also contained in this chapter. This chapter is crucial for report readers, as it gives all necessary information pertaining to companies, and their novel strategies for staying at the front edge of market. A comprehensive research methodology is adhered to by TMR’s analysts while developing market research reports, which help them in delivering precise & accurate forecasts and insights related to the intended product or process. The research methodology employed entirely relies upon primary and secondary researches, for further gaining necessary information on the global bio-based succinic acid market. The information aggregated is then validated by the analysts a couple of times, for ensuring it as an authoritative & authentic source of reference for clients while making their business decisions.